The Crookers duo. Bot is on the left, Phra on the right. 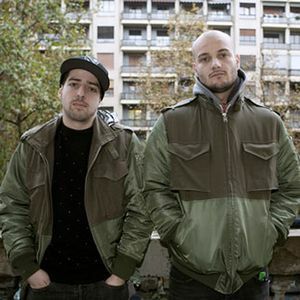 The Crookers is a duo of real-life DJs from Milan founded in 2003 by Andrea Fratangelo and Francesco Barbaglia, whose respective nicknames are Phra and Bot. They are most famous for their 2008 remix of the song "Day n' Nite" by Kid Cudi, and also for being the DJs of Electro-Choc in The Ballad of Gay Tony, as most of the playlist of the radio station in this game features their own mixes. Many of the songs are their own material, and was showcased to promote their upcoming 2010 album "Tons of Friends". Both of them started playing the guitar at a young age, before moving on to synthesizers, turntables, and sequencers. Phra himself was introduced to the DJ world at the age of 11, being on the Italian hip-hop scene. When the two met, they were both trying to branch out of their genre and explore dance and electro styles. Phra comments about their first collaboration, which was a success: "It felt natural to team up, seeing that we had the same musical tastes… which isn’t that easy here in Milan". The duo exist in the GTA IV universe, and are said to be broadcasting live from Maisonette 9 - except, unlike Bahamas Mamas from Vladivostok FM, they cannot be seen in person in-game. They have a tendency to speak in Italian in-between songs, although some would believe they're also mixing in some Spanish or Portuguese. See the Electro-Choc article for a complete transcription and translation. This page was last modified on 26 October 2013, at 14:19.